There are times that modelers need to be able to either cut out stencils or make patterns for other purposes, usually painting, that is difficult to accomplish with a knife or compass. Knives work well with straightedges and compasses do circles, but any other complex shape is difficult to obtain in a smooth set of movements. This new British-made device is basically a pen-shaped handle that has approximately a 15mm offset at the base and a backward angled carbide cutting blade that is designed to work vertically when the device is held in the hand at a natural 45 degree angle. The cutting blade swivels, so it tracks with whatever direction the handle is moved. I watched the demonstration at the 2015 IPMS Nationals by Matt Greenburg, who is the importer and distributor in the US. He showed how it can easily cut out decals, make masks from frisket paper and other materials, and how it can be used for initial scoring of plastic over 0.005" thickness. 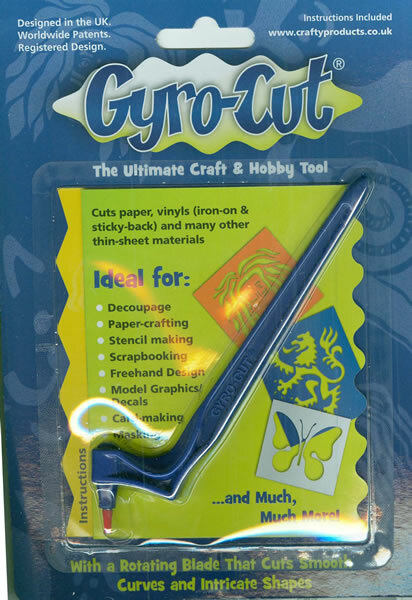 Using the device was not much harder than drawing with a pencil, so if one can draw then one can cut or score objects with the Gyro-Cut. Overall this looks to be a handy tool, albeit I think aircraft and ship modelers that do not have “bits” that get in the way like armor modelers do will get more use out of the stencil cutting feature. Still, it will help me with the initial duplication of parts with complex shapes.